Most of you know what uplighting is. 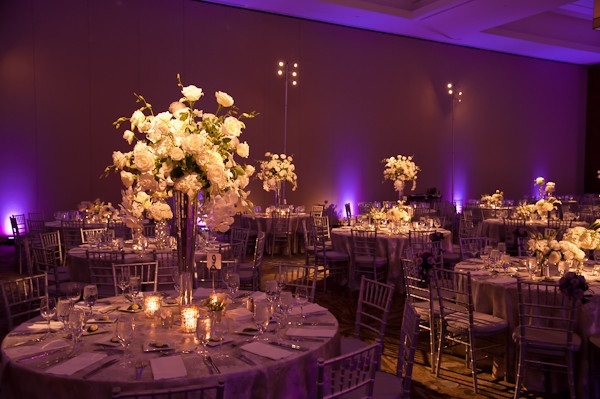 Uplighting is the lights that face upwards that go around your wedding or event venue. It can be in a myraid of different colors and basicially it changes the color and the mood of the event. If you use uplighting you can keep it the same color all night, you can change the color throughout the night to create different moods. An example would be a nice relaxing blue or green during dinner and then red or orange when it is time to get the dancing started! The pricing of the uplights can vary depending on the type of lights and the system that is used for them. If you are looking for lighting professionals always ONLY use LED lights. These won't get hot in case you have children attending or draping around the walls. Pinspotting on the other hand is the use of smaller lights facing down from the ceiling to highlight centerpieces, cake, the sweetheart table and more. Most brides dim the lights to make things romantic, but if you don't add some sort of lighting then how are your guests going to see those $200 centerpieces? This is not something that you can DIY and get it done correctly. Hire a lighting professional for your wedding day to make sure that everything is perfect. A professional to do some basic uplighting and pin spotting should cost around $1,500.